Spend the morning exploring Hawaii Volcanoes National park, where you tour Kilauea, an active volcano. Learn about the island’s most active volcano, and steam rising from its volcanic vents. After a picnic lunch (provided) continue on through Hilo along the coast to Umauma Falls where your biplane adventure begins. 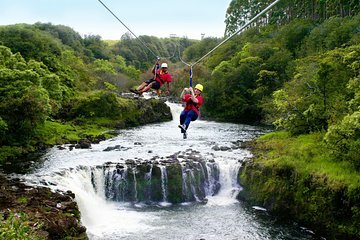 Take four thrilling turns gliding across the zip-lines over the river and waterfalls as you take in panoramic views of the mountains and ocean around you. Please see restrictions and requirements for zip-line participants.